Variability was the main complaint, which may have been the programme, or the recovery method. Recovery rates were improved dramatically by retreiving embryos on the 6th or 7th day after mating. Flushing took place at the fallopian/uterine junction, which also reduced surgical trauma seen previously. F.S.H. stimulation proved more consistent than P.M.S.G., and is now used exclusively. F.S.H. products available in the marketplace include: F.S.H.-P, Folltropin, Ovagen, Pluset, Super-Ov, and Ova-Plus. Generally, as pertain to goats, F.S.H. products that are low in L. H. (Lutenizing Hormone) perform better than those with higher L.H. As the L.H. content increases, so does the variability in results increase. Dose rates of 20-25mg should be given to each donor over a three or four day period, at 12 hour intervals. Oestrous suppression is now conveniently achieved by use of an intra-vaginal device called a CIDR. In the goat, these will suppress oestrous quite adequately for an 18 day period (ie: from CIDR in, to superovulation). Changing the CIDR prior to superovulation is not necessary. Day 17 - F.S.H. A.M. - F.S.H. P.M.
Day 18 - F.S.H. A.M. - F.S.H. P.M.
Day 19 - F.S.H. A.M. - F.S.H. P.M. These animals are sensitive to change. In order to acclimatize the Boer for embryo transfer procedures that are going to take place during the programme, any changes in environment, feeding, or handling must be presented to the animal well beforehand. (ie: grouping donors together, etc.) A lot of thought must be given to the pre-programming care of this animal. It will perform exceptionally well or not at all. This is dependent upon the owner's management. Expectations: An adult Boer doe will, on average, produce 13 useable embryos, with a possible range of between 0 and 53. 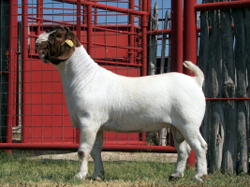 A seven month old Boer doe kid will produce, on average, 8 useable embryos, and can range from 0 to 28. Note that yields in the zero range are usually the result of poor management. Pre-mature luteal regression, a syndrome that is not uncommon in Boer goats, is caused by stress. Prostaglandin is released soon after ovulation causing the developing corpus luteum to regress pre-maturely. By Day 6, the corpus is regressed, and normally embryos are not recovered. Embryo Splitting has only recently become commercially viable in the goat. Approximately 50% of embryos recovered are suitable for splitting. The pregnancy rates from these demi-embryos are similar to fresh whole embryos (ie: 70-80% scanned foetuses to embryos implanted), and it has now become very economic to use embryo splitting as a procedure. The absolute key to a successful embryo transfer in Boer goats is to think well ahead, not 4 weeks, but 4 months. What we have learned from many years of practice, is that the most successful results are achieved by those who closely follow the proven protocol, as setforth in this paper. See also: "Artificial Insemination in the Boer Goat".